Only one of the two pilots on ill-fated Germanwings flight 4U 9525 was inside the cockpit when the plane crashed, a German state prosecutor said, confirming earlier media reports. "One was in the cockpit and the other wasn't," Christoph Kumpa at the prosecutors' office in Duesseldorf told Reuters by phone, specifying that he got the information from investigators in France. Earlier, several media outlets, citing anonymous sources close to investigation and familiar with the ‘black box’ recordings, reported that one of the pilots left the cockpit and was not able to re-enter it. On the audio from the recovered flight recorder, a pilot seat can be heard being pushed back, the doors of the cockpit opened and closed, and then unanswered knocking on the door, a source told AFP, adding that "there was no more conversation from that point until the crash." It was the captain who remained in the cockpit, while the first officer was locked outside, Le Monde specified, citing its own source close to the investigation. The two pilots were reportedly speaking normally at the beginning of the flight. The sound of alarm indicating the proximity to the ground could be heard on the recording just before the crash. An investigator interviewed by The New York Times, who wished to remain anonymous, described in greater detail how the pilot left outside the cockpit was trying to make his way back. Lufthansa was not able to immediately confirm reports of a pilot being locked outside the cockpit of the crashed Airbus 320, a spokesman for the company told DPA news. A320 cockpits have safeguards in case one pilot inside becomes incapacitated while the other is outside, a pilot who flew A320s for six years told AP on condition of anonymity. He explained that the pilot inside the cockpit can see via video feed who is trying to get inside and can either open the door or deny access. In case of no response from inside the cockpit, a member of the crew can tap in an emergency code and, if nothing happens after that, the door automatically unlocks in 30 seconds. But if someone inside the cockpit deliberately wishes to keep the door closed, denying access, nothing can be done from outside. 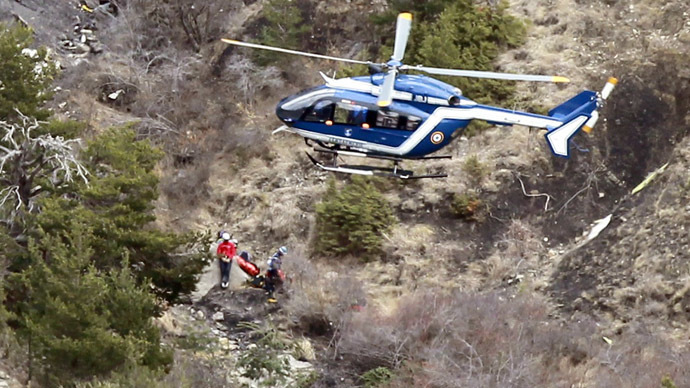 The reports have contributed to the mystery surrounding the doomed Germanwings flight, which started descending one minute after reaching its cruising height and continued to lose altitude for eight minutes before crashing in the mountains of Southern France, killing all 150 people on board. The crew never sent out a distress signal. One of the two flight recorders was found a few hours after the crash. Only the casing for the second one was recovered with no contents inside, according to AFP. The captain of the crashed Airbus 320, who joined Germanwings in May 2014, previously worked for Lufthansa and Condor and had more than 6,000 hours of flying time, Lufthansa said. The co-pilot was much less experienced, with 630 hours of flying time. He joined Germanwings in September 2013, directly after training.